Fresh details have emerged about how complex and layered was the hoax involving Notre Dame star linebacker Manti Te'o and his fake girlfriend, "Lennay Kekua." According to ABC News interviews and published reports, Te'o received phone calls, text messages and letters before every football game from his "girlfriend." He was in contact with her family, including a twin brother, a second brother, sister and parents. He called often to check in with them, just as he did with his own family. And "Kekua" kept in contact with Te'o's friends and family, and teammates spoke to her on the phone. "There are a remarkable number of characters involved. We don't know how many people they represent," Notre Dame Athletic Director Jack Swarbrick said at a news conference this week. "There are male and female characters, brothers, cousins, mother, and we don't know if it's two people playing multiple characters or multiple people." "It goes to the sophistication of this, that there are all these sort of independent pieces that reinforce elements of the story all the way through," he said. One of Te'o's teammates who asked not to be identified told ABC News that it was normal for Te'o to pass his phone around to teammates when he was on the line with "Lennay" so they could say hello to her. "I talked to her," this teammate said. "I wasn't suspicious." When Te'o got the call telling him that Lennay had died last fall, he was in the locker room, the teammate said. "He got real emotional, crying," the teammate said. "He's an emotional guy." The teammate said he thinks Te'o genuinely got hoaxed. The fact that Te'o talked about meeting her and touching her hand - when really he only "met" her on the internet - makes this teammate think that he was not completely telling the truth about his relationship. "I think he was just embarrassed about it, the whole internet thing," the teammate said. The player said he hasn't talked to Te'o since this story broke. With so many questions swirling around the revelation that Te'o's fake girlfriend, a source in the Notre Dame athletic department said the school would like Te'o to speak out publicly, but noted that they are not currently in touch with him. "At some point the ball ends up in his court," the source said. "We're not involved right now." A newly released transcript of "Sports Illustrated" writer Pete Thamel's Sept. 23 interview with Te'o gives a hint at the staggering depth of the deception. Te'o told Thamel that Lennay Kekua's real name was Melelengei, but since no one could pronounce it properly it was shortened to Lennay. But her family nicknamed her Lala, he said. Te'o's knowledge about the details of his girlfriend's life was often murky, including her majors in school, occupation and extent of her injuries after an alleged April 28 car accident with a drunk driver. What he was absolutely clear about was how much time he spent in contact with her, especially while she was in the hospital recovering from the car accident, which led to the discovery of her leukemia. "I talked to my girlfriend every single day," Te'o told Themel. "I slept on the phone with her every single day. When she was going through chemo, she would have all these pains and the doctors were saying they were trying to give her medicine to make her sleep. She still couldn't sleep. She would say, 'Just call my boyfriend and have him on the phone with me, and I can sleep.' I slept on the phone with her every single night." Te'o recounted how his girlfriend who was "on a machine" after being in a coma. "We lost her, actually, twice. She flatlined twice. They revived her twice," he said. "It was just a trippy situation." For a while Kekua was unable to talk and he described the nurse-deemed "miracle" of how Kekua's breathing would pick up when she heard his voice on the phone. "There were lengthy, long telephone conversations. There was sleeping with the phone on connected to each other," Swarbrick said. "The issue of who it is, who's playing what role, what's real and what's not here is a more complex question than I can get into." Perhaps one of the most touching displays of love from Kekua to Te'o, he told the writer, was the one-page letter she would write him on her iPad before each game. One of her siblings, often her twin brother Noa, would then read him the letter over the phone before sending it to him. "She and I, man, we had this relationship where it was just amazing," Te'o told Thamel. "With all of that time on her hands in the hospital, she was never thinking about herself and what was hurting her. She was just always thinking about others. She went on and wrote a letter to me before every game. Things that she would want me to know." Kekua and her family were also in frequent contact with Te'o's family and friends. 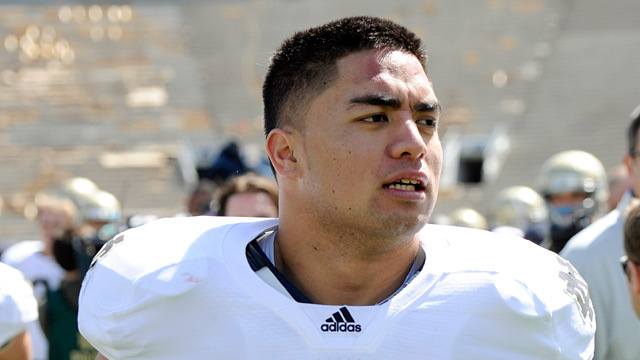 Te'o's father Brian Te'o told Themel that he had received a condolence text message from Kekua after his mother died. They also spoke on the phone "at length" and Brian Te'o also spoke to Kekua's brothers after her death. Dalton Hilliard, a close friend of Te'o's from Punahou High in Honolulu who now plays football for UCLA, told Thamel that he was often in touch with Kekua. "She was a very supportive, loving passionate individual," Hilliard told the writer. "She was all about God and prayer and being able to have faith. Me and her never met in person. But I felt like this was a testament to who she was. She would still text and tweet me before my games." When Kekua "died" in September 2012, the news came from her brother who texted Te'o from Kekua's phone number, he told Thamel. The brother then called Te'o to deliver the news. "He was just crying and crying and crying," Te'o said. "I just had to calm him down. I was like, 'You have to speak clearly. I need to know what's going on.' That's when he told me, 'Lala is gone.' That's what they call her. They call her Lala." "Catfish" movie director and actor Ariel Schulman told "Good Morning America" today that he believes there may have been "a few other people duped by the fake Lennay character." Te'o has kept a low-profile since the news of the scandal broke. He released a statement calling the situation "incredibly embarrassing" and maintaining that he was the victim of a horrible hoax.